Use Microsoft Flow in your business to improve productivity through automation with this step-by-step introductory text from a Microsoft Flow expert. You’ll see the prerequisites to get started with this cloud-based service, including how to create a flow and how to use different connectors. Introducing Microsoft Flow takes you through connecting with SharePoint, creating approval flows, and using mobile apps. This vital information gives you a head-start when planning your Microsoft Flow implementation. The second half of the book continues with managing connections and gateways, where you’ll cover the configuration, creation, and deletion of connectors and how to connect to a data gateway. The final topic is Flow administration and techniques to manage the environment. 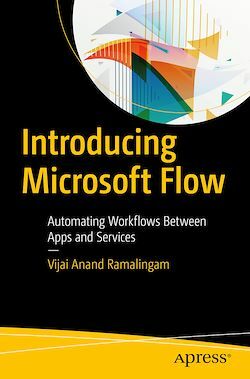 After reading this book, you will be able to create and manage Flow from desktop, laptop, or mobile devices and connect with multiple services such as SharePoint, Twitter, Facebook, and other networking sites. Administrators and those who are interested in creating automated workflows using templates and connecting with multiple services without writing a single line of code.